The men, women, bands and equipment of the National Services Day on display for a family day. Spectacular parade from Parnell Square to Dublin Castle and an opportunity to meet Ireland's state and voluntary personnel, their equipment and vehicles. 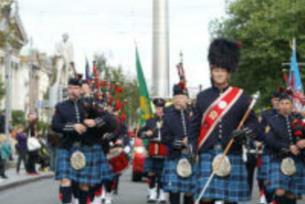 Established as National Services Day in 2018 the first Saturday in September sees the bands, personnel and vehicles of the nations emergency and security services parade from Parnell Square to Dublin Castle. Dublin Castle itself shall host displays of each of the services - Dublin Fire Brigade, RNLI, Irish Coast Guard, Revenue & Customs, Airport Fire & Police, Civil Defence, Order of Malta, St Johns, Irish Prison Service, ONE, Irish Water Safety, Community First Responders, Blood Bikes and An Garda Siochana. Intended to celebrate the dedication of staff and volunteers alike in their service to the state and allow the opportunity for all young and old to engage with the services. Family friendly and free of charge.